The launch of a pro-government newspaper in South Africa today was postponed when the editor and four senior staff quit hours before the first issue was due to go to press. The New Age has promised “more positive” news and to highlight the achievements of the governing African National Congress (ANC). Its owner, the Gupta Group, has close links with President Jacob Zuma and his family. The paper was due to hit the streets this morning, but at 3pm yesterday there was a staff mutiny involving the editor, Vuyo Mvoko, the deputy editor Karima Brown and three other senior staff. Gary Naidoo, managing editor of the New Age, told South Africa’s Talk Radio 702: “We were ready to go to print. We withheld that publication with respect for those editorial staff that have stayed on. Naidoo estimated that the newspaper, already delayed from an original launch date of mid-September, would be published in “maybe a week, two weeks”. There were reports in the South African media that the incident followed a disagreement with the owners over the paper’s editorial stance. Mvoko was understood to have resigned because he felt his authority was being undermined. The New Age’s owners are Indian businessmen who arrived in South Africa in 1993 and built their fortune from computers. 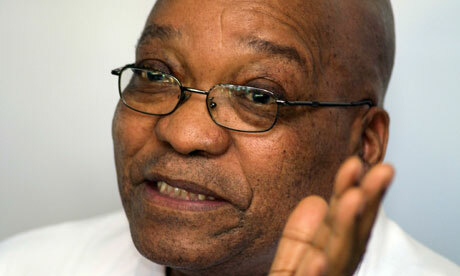 Concerns have been raised about the Guptas’ nine-year relationship with Zuma and his family. Atul Gupta is said to be a close friend of Zuma; Gupta’s brother, Rajesh, and Zuma’s son, Duduzane, are business partners who own shares in the steel company ArcelorMittal. The walkout by staff came on national press freedom day in South Africa, an event marked by protests and debates because of two new measures being considered by the ANC. The party is pushing for the creation of a statutory media appeals tribunal and new laws that would broaden the definition of official secrets, with whistleblowers and journalists who infringe them facing up to 25 years in prison. The ANC says legislation is needed to make journalists legally accountable for inaccurate reporting. But there has been an outcry from journalists and figures such as Desmond Tutu and the writers André Brink and Nadine Gordimer. Many say the laws are reminiscent of the apartheid era and would be abused to cover up government corruption. Hundreds of demonstrators marched to Constitution Hill in Johannesburg in a silent protest yesterday. Kader Asmal, a former cabinet minister, told a meeting at Wits University: “Who can fight the persistent calls to respect freedom of the press from Nelson Mandela?